Lachlan Wilmot is in his seventh season as the Senior Athletic Performance Coach for the GWS Giants, an AFL Club based in Sydney. 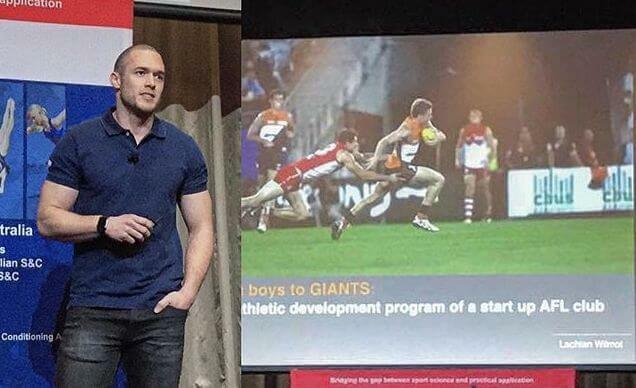 Prior to this he spent time with the AIS-AFL Academy and NSW/ACT AFL Academy. In this show, Lachlan and I take a deep dive into the world of plyometrics. We discuss the biggest mistakes coaches are making, how he uses contrast training with great success, and then get down to brass tax, talking training days, sets, reps, and even force vectors. How Lachlan got started in the world of physical preparation. His over-arching philosophy and big rocks with regards to training. What originally got him interested in plyometrics. The biggest mistakes Lachlan sees coaches make with regards to plyos. Does the old mantra of “you should squat 2x body weight before doing plyos” hold any water? How he introduces and incorporates plyos into his large group and team settings. Programming: How you should prescribe sets, reps, training days, and even force vectors into your programming. The next step in his plyo evolution. A fun lightning round where we discuss his current book selections, his biggest influences in the industry, and his ONE piece of advice for young coaches.